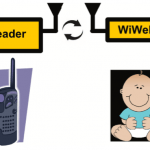 Based on work as part of the Children’s Hospital of Atlanta (CHoA) pediatric seed grants competition, a team of researchers put together this report in 2013 on the design of a battery-free moisture sensor for diapers and bed-wetting. 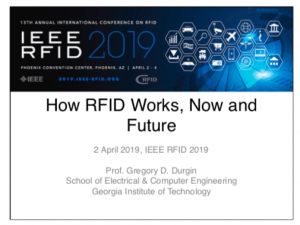 The final design showed that diversity antennas feeding two RFID chips and a common moisture sensor could be placed on a low-cost, flexible inset and interrogated accurately in a room with a UHF RFID reader. Download the report here. 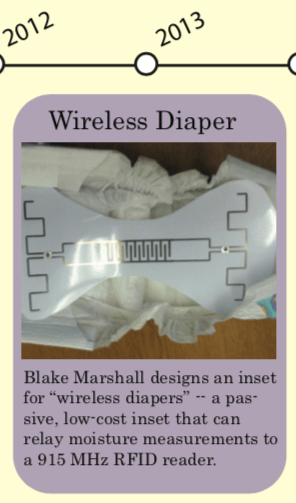 Blake Marshall designs an inset for “wireless diapers” — a passive, low-cost inset that can relay moisture measurements to a 915 MHz RFID reader. 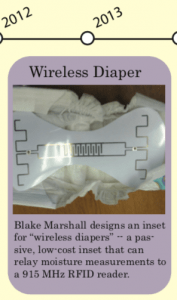 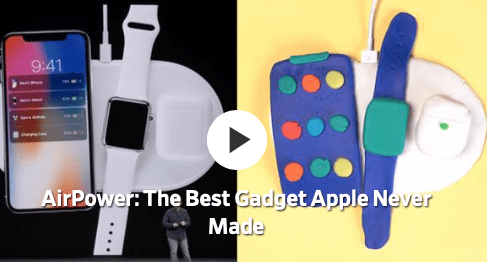 In 2013, the GTPG partnered with the Children’s Hospital of Atlanta’s Pediatric Innovation Seed Grant program to develop what colloquially became known as “wireless diapers”. 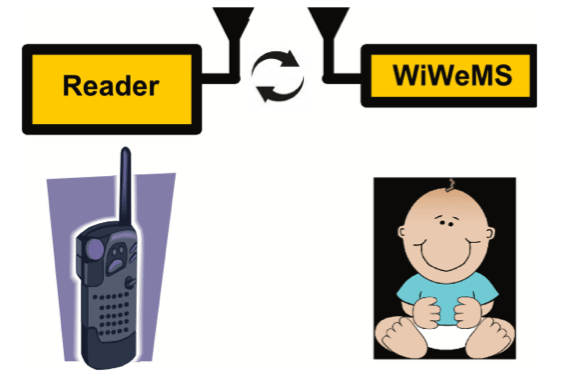 The thin, low-cost, flexible inset could be placed inside of a diaper or a garment and read by a standard 915 MHz RFID reader. With two diversity antennas and a capacitive moisture sensor, the sensor could reliably power up and measure moisture — even while worn by the user.